Denny Jump (Bellevue, WA, United States) on 13 January 2018 in Landscape & Rural. I like how the branches are so weighted down with the snow. And that wonderful light in the background. A first rate image, Denny. 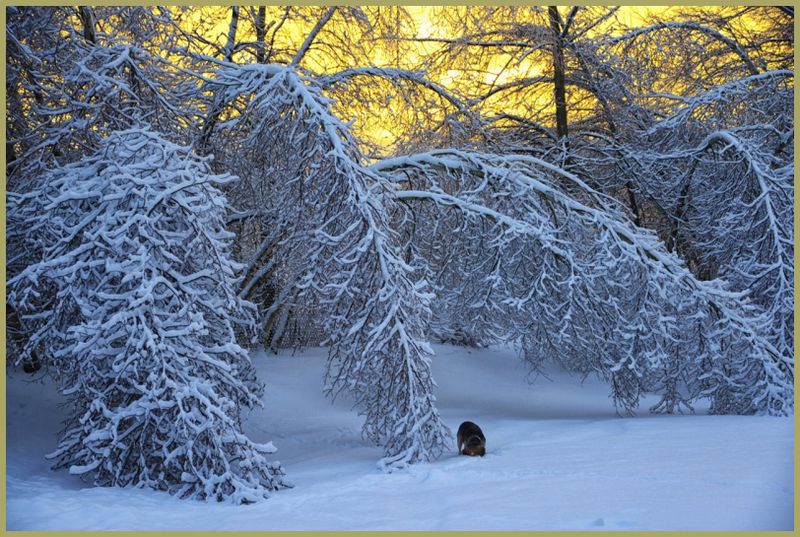 A beautiful composition with these branches so heavy and beautiful, the light which bursts behind and the small dog to say the life in an extraordinary nature. A classic and beautiful wintry scene. I love that radiant sky tone offset by the heavy snow below. I agree completely with Michael! This is first rate, sir!!! Wouhaaaaaa! C'est très beau ! Even though I hate ice storms, this is gorgeous. The golden light is a delight. @Steve Rice: Yah, we were stranded on this day (26 Dec 2013) and about 3 additional days as I recall...But at least we were with family and daughter Amy had prepared an additional supply of her delicious baked cookies, fudge,and all sorts of goodies....and I had made about 3 gallons of home made egg nog (my famous non-alcoholic concoction) ,,,,and we were all together having fun, so that helps.....Finally, a sadder note: The dog you see here is Russ....Poor old guy had to be put down this past month (12/2017) and he is now waiting at the Rainbow Bride! He was the Sweetest guy!! ,,Their other dog, Libby, she is slowly adjusting from the loss of Russ...Unless one has an animal, as you and we do, it is very difficult to understand why we all get so torn up, isn't it? :-( you have an animal 11passed away Thank you so much, Steve! This is just stunning Denny! A magnificent winter scene! Just beautiful! Absolutely superb! Love the snow covered branches and the contrast that the warm golden light provides. @Darkelf Photography: Thank you Maciek! Yes, the sun was just coming up and was very low on the horizon and was just awesome.This image, although not perhaps the best quality, is truly one of my favorites of all time. The warm sunlight is such a contrast to the beautiful landscape!! And what an effect the ice had on the trees here.